This year’s Thanksgiving meal was truly extra special. In several ways. For the first time, our daughter and I actually cooked it together. In her kitchen, in her house. With some help from her husband who deep fried the turkey to a golden brown delight while my husband supervised. And our 6 month old blessing, our first granddaughter, was right there watching, smiling and laughing, and wearing her “Gobble til You Wobble” shirt. And I’m sure anticipating next year, after her first two teeth have been joined by all the others, and she can actually eat a real Thanksgiving meal (I don’t think the banana baby food she had really counted)! I have to say, this Thanksgiving was the first one in the ten years since my mother passed away, that I truly enjoyed the day without having a moment in which I wanted to cry. Because I was surrounded by the most special family ever. My husband, our daughter and son in law, and their first child. I did remember Thanksgivings past, from the time Ashley was just a baby and my own mother was more interested In holding her granddaughter than eating dinner. I remember her feeding baby/toddler Ashley from her own plate when she was old enough to eat regular food, and how proud she was of her when she enjoyed it and clapped her little hands for more! I remember my mother letting Ashley help her make the cinnamon buns for the first time, watching her get flour all over the floor as well as herself and her grandmother, and my mother not caring a bit! And she always let her have a bite of the raw dough, no matter how much I said not to. 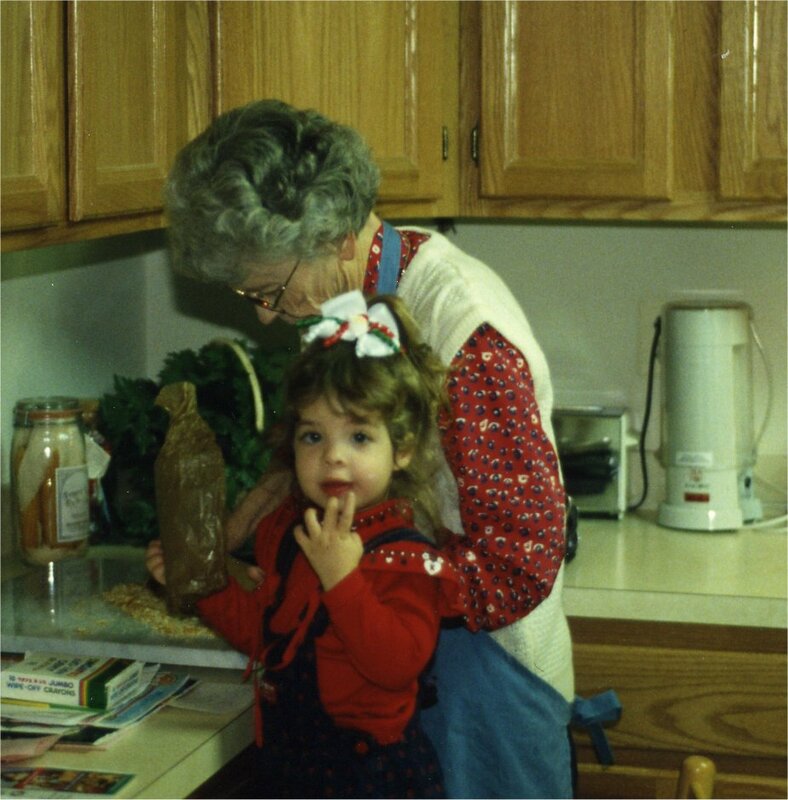 And as the years went by, one tradition held firm…Ashley always helped her grandmother make the cinnamon buns. And they were always delicious! Because they were made with such love. After dinner was over, the leftovers put away, and over slices of pumpkin pie, we’d all go through the newspaper ads to plan our shopping for the next day. At first my mom and I would pick out things we wanted to get, but it wasn’t long before Ashley took over the ads, even as a little girl, and picked out all the toys she wanted Santa to bring her. And also telling her grandmother what she could get for her as well! The next day was spent with the three of us at the mall, three generations, happily planning a Christmas to remember, going through beautifully decorated and crowded stores to find the gifts we wanted, and waving at Santa until Ashley could get up her courage to go talk to him. We’d come home exhausted and let Ben bring our shopping bags inside and warm up the leftovers. Another ritual successfully completed….! And this year, we began those traditions anew. With myself as grandmother to Baby Rachel who sat happily beside me in her high chair during dinner. And looking at all the newspaper ads after dinner as we enjoyed our pumpkin pie, with my granddaughter sitting in my lap, not quite sure what we were doing, but somehow understanding it meant fun was coming! Yes, now I have taken the place of my own mother as matriarch of the family. Yes, I still miss my mother dearly, and certainly had moments where I wished she’d been there, but our family once again proudly has three generations of strong women to love and nurture each other. To pass along family traditions, family stories, and yes, even family recipes. And to make our own new traditions as well. And we will surely enjoy every moment of making those new traditions. I hope you and your family had a wonderful Thanksgiving, and made a lot of wonderful memories as well!